long time guitarist Scott Gorham formed 21 Guns. Lead by Thin Lizzy's long time guitarist Scott Gorham, this was reason enough for me to check out this disc. The music sounds nothing like Thin Lizzy, however. 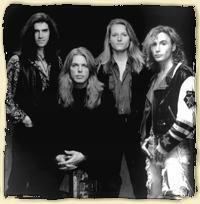 21 Guns is a catchy 80's AOR/melodic metal band, with tons of hooks and smooth as silk vocals. Actually I was quite surprised at how good this disc actually was. I'm not sure why, but I expected a dud, what I got was another excellent cd to add to the collection. Disc number two for Scott Gorham and band. First thing that struck me before even listening to this disc was that it contained a cover of Thin Lizzy's "King's Vengeance." Of course I am not sure it can be considered a cover since Scott Gorham co-wrote the song, but since it is not Lizzy doing it, I will call it as such. Upon listening, 21 Guns has updated their sound a bit, adding in some more modern elements, yet retaining their melodic, AOR label. This particular disc was never released in the U.S., as far as I know and was at first only released in Japan where the band had gained a following. In 2000 Z Music in England re-released "Nothing Real" with a slew of bonus songs, all of which are demo tracks. There is a noticeable decline in production from the album to the demo cuts, but they are still quite listenable and very enjoyable. One again, I had to rely on the kindness of a friend to hook me up here. While I see the band's first album all the time I have not even once seen this disc, not even on eBay.